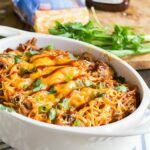 BBQ Spaghetti Casserole with bbq pork, bbq sauce, green onions, and cheese is like the spaghetti version of BBQ Chicken Pizza. 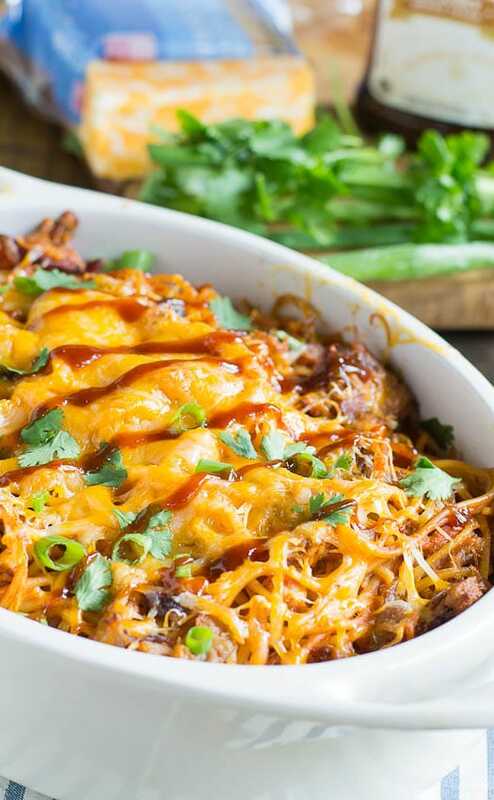 To make this comforting casserole, I pick up a pound of pulled pork from my favorite bbq restaurant. It’s smoky, moist, and fabulously delicious. You could also use some homemade bbq pork or even bbq pulled chicken. The pork that I use doesn’t have much sauce added to it. If yours is heavily sauced, you may want to add less bbq sauce to the casserole. I like to use a thick and sweet Kansas City-style bbq sauce. Usually I use KC Masterpiece brand sauce. To cut the sweetness of the sauce some and make the casserole a little more spaghetti-like, I add an 8-ounce can of tomato sauce, plus some tomato paste. A little sour cream contributes some creaminess. Some green onions provide some color contrast and flavor and a nice blanket of cheese on top finishes the casserole of. I usually use cheddar, but you could blend in some Monterey Jack, or use a Mexican cheese blend. I like a little cilantro on top, but you could leave that off or use some parsley instead. The finished dish is a comforting, delicious casserole that tastes like no other casserole. 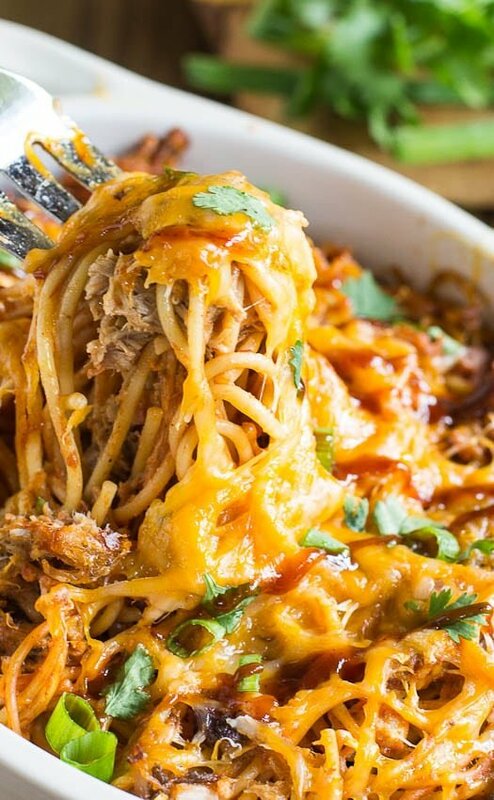 A spaghetti casserole with bbq pork, bbq sauce ,and cheese. It's like the spaghetti version of BBQ Pizza. Lightly grease a 9X13-inch baking dish. Heat the oven to 350 degrees. In a large bowl combine bbq sauce, tomato sauce, tomato paste, and sour cream. Stir well. Add pasta, bbq pork, and green onions to bowl and toss to combine well. Pour mixture into prepared casserole dish. Top with cheese, cover with aluminum foil. (spray foil with cooking spray so it will not stick to the cheese.) Bake for 20-30 minutes or until hot all the way through. Top with cilantro and drizzle a little additional bbq sauce on top. Use a pound of pulled pork from your favorite bbq restaurant. You could also use some homemade bbq or even pulled chicken, but I find using a nicely smoked bbq works best. If your bbq pork already has a lot of sauce, you may want to cut back some on the bbq sauce added. I use a sweet and thick Kansas City-style bbq sauce. This entry was posted in Casseroles, Main Dishes and tagged BBQ, casserole, pasta, Pork, spaghetti. Bookmark the permalink. Thank you for this inspirational dish…. I made this with smoked pork belly,shredded.. then I used linguini that I tossed with sun dried tomato pesto, Used Montgomery Inn BBQ sauce. It was a football game hit!!! Can you freeze this, then thaw and cook as directed? LOVE BBQ spaghetti! Lucky for me, I made a pork roast last weekend with leftover for this Yummy dish! I like the idea of putting a bit of tomato sauce to cut the sweetness. Great dish for week night dinners and pot lucks too! Made this for dinner . It was really good. Wow! This was amazingggg! I used spaghetti Squash to lighten it up, and I’m glad I did because I just about ate the whole casserole myself! So so good. Yes, you can assemble it ahead of time and bake it just before serving. I made this last week, and LOVED both the flavor and the ease of the recipe. I had a good sized portion of leftover Asian BBQ pulled pork that I made from Wegman’s ready to cook entrees (try it sometime, if you’re not in the mood to pull a big meal together! They are tasty and easy. ), so I thought this recipe would be perfect for it. The Asian BBQ wasn’t an overpowering flavor, so it was easy to fit into this recipe. I didn’t add the sour cream, because my man hates it, but I absolutely will if I ever make it for myself. To enhance the asian flavors in my pork, I drizzled sriracha on top instead of extra BBQ. Such a comforting dinner! Thank you so much for posting. Based on previous reviews I tried this for my family of four. Sorry but this is godawful. All we tasted was bbq sauce. Gross. Yeah, I have to agree with you. Definitely not my favorite. This was really good, my son and I loved it; and it was so easy! Oh wow! I’ve personally never seen a recipe like this before but it sure as heck looks so, so delicious (and easy to make)! Now that’s what I’m talking about! BBQ Spaghetti? Yes, please! This looks so decadently delicious, Christin! Love this recipe! 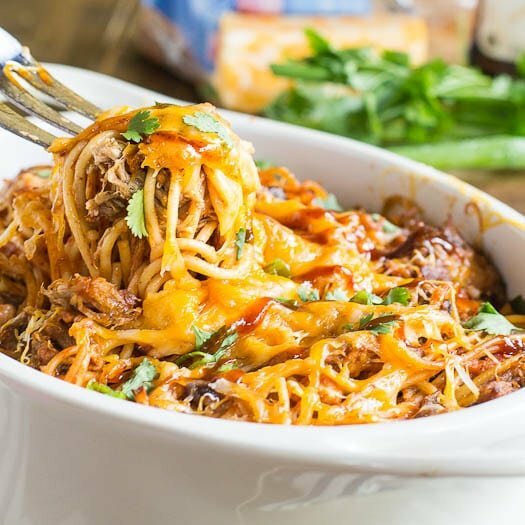 Pulled pork with spaghetti sounds like a fantastic combo! It looks amazing with all that gooey cheese! BBQ Spaghetti? Oh man I must try this!! This is one of those recipes that really shouts ‘eat me, eat me!’, and those gorgeous photos of yours certainly don’t help with that! Great idea to make a cheesy casserole with spaghetti. This is a great dish for any season, I reckon! This looks amazing! Love the BBQ- so tasty! So this is quite possibly the best idea ever. I love bbq pulled pork. It’s almost shameful! This sounds easy and soooooo delicious! All your casseroles always look so amazing, Christin! They make me want to rush home and throw them all in the oven immediately lol. What a great idea!! This sounds phenomenal! That looks so delicious Christin! I’m betting my whole family would love this dish. I knew in the back of my mind that clicking on the email link to your site on an empty stomach was NOT a good idea! This casserole looks amazing – love the cilantro on top and what a clever and simple combo, thanks so much for sharing! I bet it would be just as delicious with spaghetti squash and bbq chicken! I love the idea of making it with spaghetti Squash Shashi! That would be just as good, maybe even better.